Lock in a great price for Klimis Hotel – rated 8.9 by recent guests! 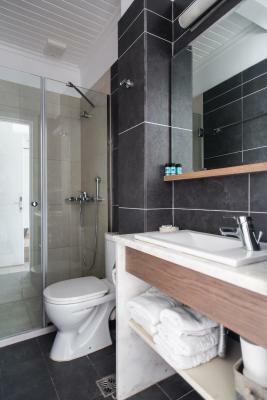 Rooms had modern clean contemporary design. Also the owners were able to address my dietary restrictions for breakfast. Highly recommend this property. The Klimis Hotel was a really great experience. 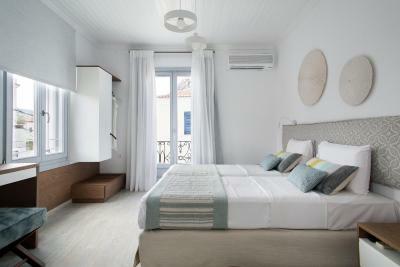 It is clean, modern, and centrally located in Spetses. I would highly recommend this to anyone and would definitely go back. The great location, the very nice sea view balcony. The friendly and very helpful staff! The desserts in the cafe. The cleanliness. The room’s decoration and the bathroom. I was tired at the last day going to the doctor and Mrs Christina who works in the hotel did a lot to me and they offered me a car to carry the luggage to the very near port too! 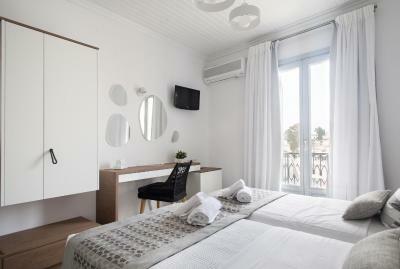 Thanks to Klimis Hotel which made our stay in Spetses more beautiful and convenient. 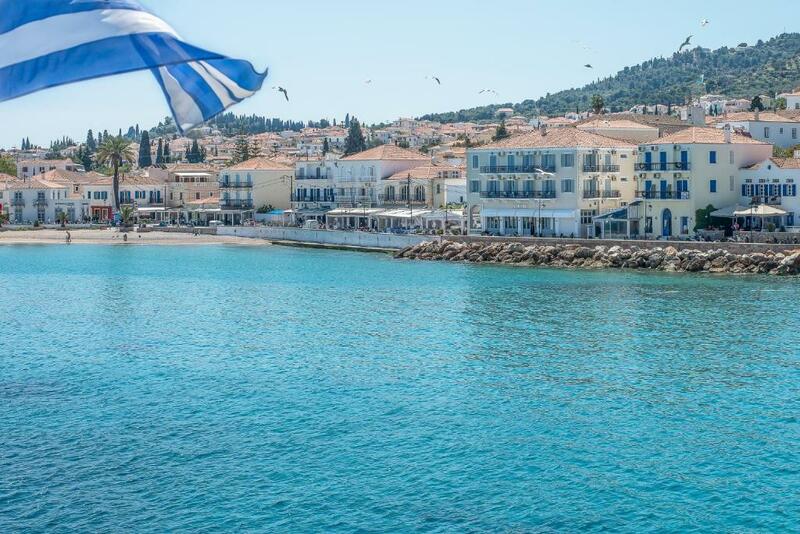 If I’ll be back to Spetses, I will stay in Klimis hotel. Really amazing breakfast, and the staff was so friendly and helpful! Good location, sea water was beautiful, nice island. Easy to ride a bike to see the whole island, beautiful views and scenery. Excellent location near town and beach. Great views. The family that own the hotel are kind and friendly; the rooms are spotless and comfortable; the location is excellent. 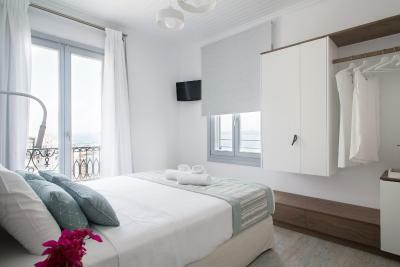 Located 50 feet from the beach of Agios Mamas, Klimis Hotel offers tastefully decorated rooms with free Wi-Fi. It includes a café with traditional pastries and serves continental breakfast in the morning. 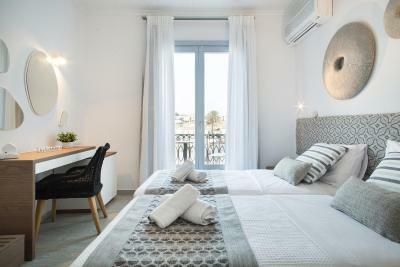 Klimis rooms are decorated in white tones with gray accents, while some enjoy views over the sea. 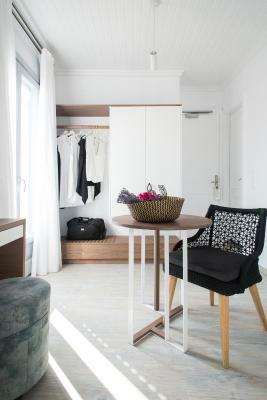 All units are equipped with a flat-screen TV, air conditioning and safety box. 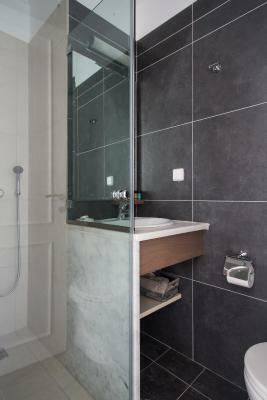 The modern private bathroom features a hairdryer and free cosmetics. 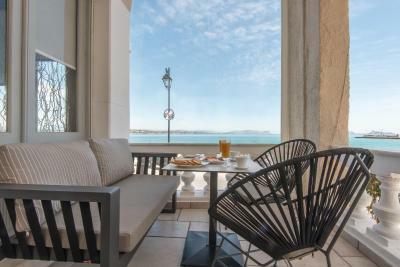 Guests can start their day with the continental breakfast served at the hotel's dining area, including fresh orange juice, a wide selection of coffee and croissants. 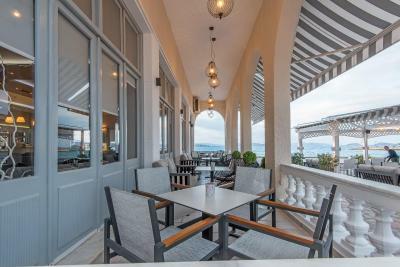 The hotel’s café is located on the ground floor and serves homemade desserts, waffles, snacks and refreshing cocktails. Room service is also available. 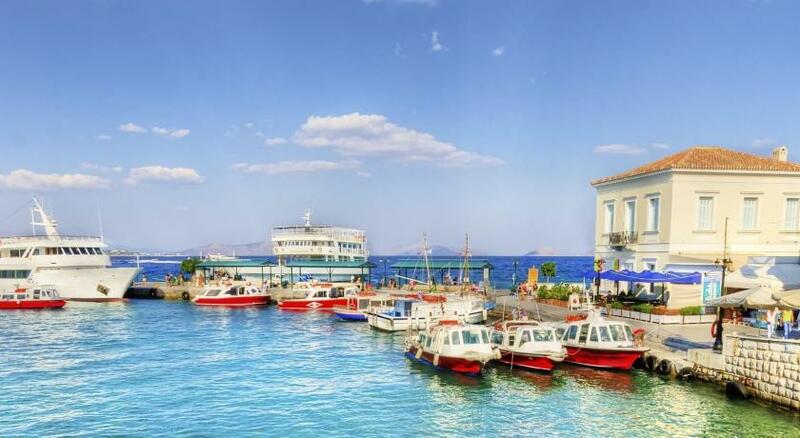 The port of Dapia can be reached within 350 feet and features many cafes and restaurants. The hotel’s staff can make arrangements for car and bicycle rentals. Free parking is possible near the premises. When would you like to stay at Klimis Hotel? House Rules Klimis Hotel takes special requests – add in the next step! Klimis Hotel accepts these cards and reserves the right to temporarily hold an amount prior to arrival. 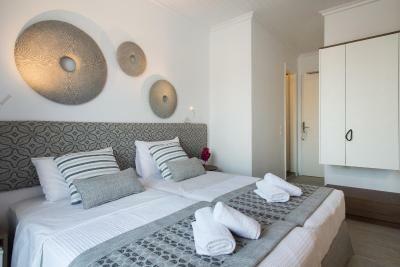 convenient location, stylish beautiful rooms, friendly staff, good continental breakfast. perfect hotel, will definitely return! It's a very nice hotel right on the frontline of Spetses in the harbour. If you get a room with a balcony, the sea view is amazing. The rooms are very pleasant, the staff was super helpful, making call to help us find everything during low season on the island. The breakfast was basic. Housekeeping was not altogether good (I don't want to go into details, so you can guess what was not cleaned properly). Very good staff. The gentleman who checked me in immediately and without being asked upgraded me at no extra charge. Everyone was courteous and helpful. Lovely sea view from my room. Good heating in a cold Greek winter. Good recommendations for eating (Argiris on the Clock Square and Ostria close to it). The only concern is that this hotel is located on the main street and so, there is a bit of traffic noise. The balcony windows were thick double-paneled. However, it was a great location near the harbor, restaurants and shopping. 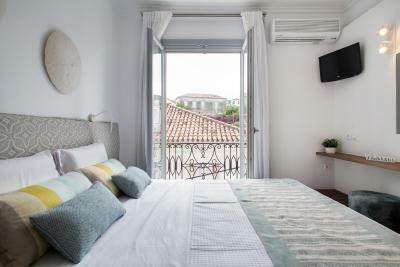 This is a lovely hotel in the center of the small town of Spetses. Overlooking the sea with a gorgeous balcony view. The room was recently renovated, clean, and comfortable. Breakfast was nice and there was a strong wifi connection. The owners were extremely friendly and accommodating. This is not my first time staying at this hotel and I highly recommend it! Lovely room decor. Excellent continental breakfast. Very near ferry terminal. Traffic noise from scooters, quad bikes and lorries was intrusive at times. Beach was pebbly. Room clean and looked recently refurbished to a high standard. Bed and bedding good quality and very comfortable. Breakfasts were quite adequate, continental style, served either in the hotel bar area or outside. Position of the hotel was second to none being right on the beach. Lots of excellent restaurants were a short walk away. Friendly staff, fast check in, clean room, good air conditioning, excellent sea view from balcony, also can see sunrise. give us local special homemade almond cake as a present when we departure. Klimis was a great host & made us feel at home in this brilliantly located property.....wish we could have stayed longer. Would prefer tea/coffee in the room and replenish the bottled water for second day we stayed. Better lighting in the toilets! Staff was extremely friendly and at the same time professional, we enjoyed every minute. Thank you for making our stay unforgettable! Excellent Location! Amazing Flexibility and Comfort offered and Beyond the Call of Duty Care provided by the staff at all times! Would definitely stay there again.